Contract protests up, contract awards down — what to do? Recent data indicates that protests have increased overall by approximately 17 percent since 2012, exceeded only by the decrease in government contract spending over that same time. The resulting increase in pre-award costs derived from protests for all parties concerned requires a step back to analyze what is driving this not-so-encouraging trend, and what, if anything, should be done about it. Most involved in government contracting today understand the recent trends of a declining overall market. Topping out at almost $600 billion a few years ago, the current federal budget has been squeezed by such things as the Budget Control Act of 2011, automatic budget sequestration, mandatory cuts, spending caps, and overall drawdown of U.S. military operations worldwide. Contractors are now competing for ever fewer dollars, as the government’s “mandatory” spending — in areas such as healthcare and retirement — continues to shrink the “discretionary” dollars available for everything else. This has resulted in many contractors leaving the federal market, either through mergers or simply going out of business, or diversifying into other business lines. For years, the question of when the government might return to “regular order” – that is, a “normal” process in which appropriations are essentially completed by the end of September — has been a prominent one. Agency leaders, industry, and others, have continually and appropriately harped on the deleterious impacts of the funding yo-yo that has dominated the scene for far too long. And if there was one thing many hoped for as a result of having one party in control of both the White House and Congress, it was a return to regular order. Well, it’s probably not going to happen. As virtually all recent reports have indicated, the budget debate within the parties, let alone between the parties, remains fierce and the chances of getting a full year fiscal 2018 funding bill by Sept. 30th are slim indeed. President Trump’s budget blueprint – the “skinny budget” — generated plenty of debate; the release of his full proposed budget will only turn up the heat further. No  budget resolutions have yet been proposed, let alone passed, and no spending instructions given to the appropriations committees. Defense Department spending on research and development has suffered historic declines during the budget drawdown that’s been in progress since 2009, falling much more sharply than the rest of DoD contracts, and reversing the usual pattern in which the military has tended to guard its R&D funding so it has systems ready-to-procure the next time it goes to war. The insights came via one of the deep dives the Center for Strategic and International Studies regularly conducts into federal procurement data. 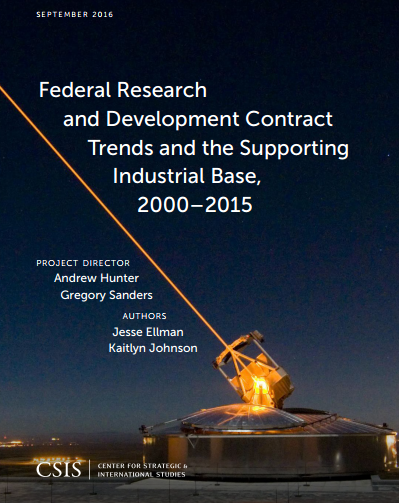 The center found dollars spent on R&D contracts fell by 53 percent between 2009 and 2015 even while overall contract spending declined by only 35 percent. Put in terms of its share of a shrinking pie, R&D makes up just 8 percent of Defense contracts now, compared to 11 percent five years ago. 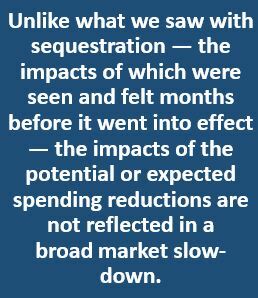 Researchers said the spending cuts had created a significant “trough” in funding for future weapons systems, something top Pentagon officials had warned about in 2013, when the sharpest R&D declines started to take place because of the Budget Control Act. The Department of Defense (DoD) will be asking for a budget of $585 billion for fiscal year 2016, according to a draft Pentagon comptroller document obtained by Politico. This amount represents $38 billion more than the budget which DoD has been operating under as a result of sequestration. In order for DoD’s budget amount to be approved, Congress will need to agree to suspend or discontinue sequestration. DoD’s five-year budget plans call for ramping up base defense spending to $570 billion in 2020. According to the draft budget documents, DoD will request $209.8 billion in funding for operations and maintenance, an increase of $14.5 billion from this fiscal year. The proposal would also increase procurement spending by $14.1 billion to $107.7 billion, and research and development funding by $6.3 billion to $69.8 billion.